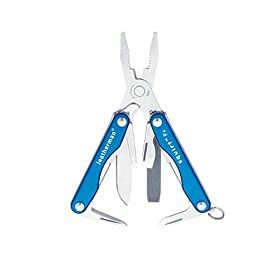 Multitools: Why are they needed. Re:"Re:More on A-flu in Argentina and face masks"
This is a short interview I did for Mike, from Your Future Books a couple days ago. The interview is pretty good and Mike used some interesting images to go along. Hope you enjoy it and as always, feel free to leave comments or questions. Hi guys, this is week 1, video of the GTA preparedness course. Yes, that's my ugly mug :-) .It's mostly an introduction, I talk a bit about what happened, drive around and show parts of Buenos Aires while commenting on it. 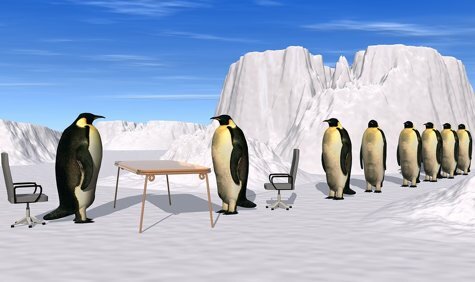 Tips for job interviews during the Economic crisis. Even though being self employed and running your own business is usually best regarding you managing your own schedules and you creating and being responsible for you own income source, the fact is that most people work more tradition jobs. When there’s +20% unemployment things change a lot regarding job hunting and interviews. I remember when traveling to Spain a few years ago when things were very different, the thing at that time in Spain and other EU countries was to actually mess up the job interviews so you could continue on the “paro”, the welfare program that paid you 80% of your last job while unemployed. Things were the exact opposite here and I thought how crazy it all was, how most people here would do anything for a job while over there jobs were something you just found quickly if you wanted to. 1) Looks. Yes, its supposedly ok to be yourself but you know what, “supposedly” wont find a job any time soon during a recession. Look you best. You can complain about discrimination all you want, but being covered in tattoos, specially that daemon eating a unicorn in your forehead, yes, I’m sure they’ll find a good explanation as of why other candidates make more sense than you. Urban tribe hairstyle or clothes, lots of piercings, none of that is going to do you any favors when looking for a job. Clean cut, formal or casual clothes depending on the work you are applying for, that creates the right image. 2)Handshake and speech. A firm handshake, but not bone crushing, you want to show confidence, not how physically strong you are. Leveled voice, but confident. The way you stand, sit and carry yourself in general, try looking confident an capable. All this you probably heard a thousand times already, but it is harder to do when you’ve been unemployed for a while and your actually are nervous and worried about finding a job soon to put food on the table. 3)Information. Know the names of the people you’re supposed to see for the interview, do a bit of research about the firm, be informed about the products offered or whatever it is they do, what you find interesting about it and share that with the person that is interviewing you. How you would fit in the company and what you have to offer. 4) Attitude. During a job interview I had once for an architecture firm, they asked me if I knew how to handle a certain software program which they were starting to use with good results. I wasn’t familiar with the software but I replied “No, I’ve never used that one before but I’m sure I can learn it pretty quick, most of them have similar functions and logic about them, I’m sure I’ll get the hang of it in no time”. I got that job and when they told me I was hired, they said they specially liked that part. It’s important for the people that are hiring you to know you wont be a problem but rather a problem solver. Not only regarding a computer program but in general terms, they see in you someone that fixes things, learns when needed and simply gets things sorted out and done. 5)Go through your notes and files. For technical jobs it would be a good idea to review some of the information you’re supposed to be acquainted with. You can’t remember everything and even if the job interviewing process doesn’t specifically require tests (like some do) its still a good idea to refresh those concepts so you have better tools for the interview. 6) Salary. Ask 20% more than what you consider an appropriate salary. Don’t think about this much, don’t do the same stupid mistake I made several times myself. Simply always ask for 20% more. If the employer likes you but for some reason can’t reach that number, he’ll come up with a counteroffer, so don’t worry. You’re not going to miss the opportunity because of that 20% extra you asked for. If you settle with 10% more as a half way through, you have 10% more and the employer considers he got a bit of a bargain himself. If you ask for a salary that is too low, that’s much worse than asking for more. It reflects a lack of confidence or worse, it clearly says you are not worth more than that. 7) Follow up. Some people don’t advice this but I’ve called a few days later on occasions to check if there’s any news, how’s the selection process is going and show my interest. On occasions you get the “don’t call us, we’ll call you” on the same interview, and in that’s the case it’s all pretty clear but on other occasions you have a good interview and yet don’t receive any news a few days later. In that case, I’d call to see how things are going. Just one call guys, one call shows you sure are interested. If after that call they still don’t contact you, that’s it, but sometimes calling is a good idea. Remember those welfare leaches, excuses of people that only live to glue themselves to the government, sucking out money out of hard working taxpayer? Well, piqueteros are somewhat similar, but worse. They are your average welfare bum on steroids. The piqueteros aren’t just lazy, violent roadblockers, most are also financed by the government as well. You see, when a government with a socialist speech deals with this human scum, they soon see an opportunity. Instead of kicking them into a jail cell like they should when they break the law by blocking public roads or looting, the government pays them to have them in their pocket. These gov. financed thugs will show up during opposing politic rallies and cause trouble, beat up people. During official rallies and marches, these thugs show up in buses along with the people they round up in each municipal region, in villas and shanty towns, to support the official government. Face usually covered for harder ID. Armed usually with large clubs, pipes, rocks and slingshots. Some are obviously armed with firearms and knives, but these are the “ok” weapons, the ones they carry openly and use to beat people up. Very violent and very dangerous given that whatever they do, they are not to be arrested. Of course if you shoot one of these you go to jail. Today driving back home I got caught by one of these groups, something I’m usually good at avoiding. I can’t express the frustration you feel as you move a slower than a snail on a main avenue and you see these… people… standing there, blocking your way. As I got near to them, a police officer took a few steps forward. I told him “ Come on man, shoot some plastic buckshot into their butts and get them out of there, this is ridiculous”. I was a bit mad to say the least. “Yes, we have to be here baby sitting, roasting under the sun sweating like pigs while these “&%$%” block the avenue. Nothing we can do, our orders are to redirect traffic and let them roadblock. Hey, if it makes you feel better, they are getting paid 600 pesos a month each”. The cop was a nice guy, he told another officer in a patrol car to move and opened a side street for me to speed away. Not exactly fair for the thousands of others in the same situation but I was still thankful, gave him a thumbs up as I speed away. Later, when at home I watched the news: Apparently other piquetero groups have been busy today. A group of piqueteros that aren’t with the government took over a supermarket demanding food like in the old days. At least this time they where arrested. Of course tonight they are all free and giving interviews on the TV like heroes. That’s the problems with thugs like piqueteros; if you allow some of them to break the law then others do the same and you can’t arrest the one’s that aren’t on the payroll for doing the same thing the official ones do. If you name a piquetero like Luis Delia, Secretary of Land and Development, a man that took over a police department and looted it, then what do you expect? You are rewarding criminal activity directly, so the kind of violence and crime we have here isn’t a mystery, it’s officially promoted! Yesterday another teacher got murdered while opening her garage door at 8 PM. She didn’t say anything, they just shot her in the back to steal her car. So that’s the way we live people, that’s what we got used to in this wonderful country of ours. Its’ pretty simple and self explanatory. 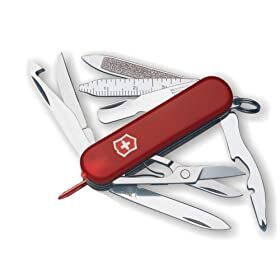 Everyone that ever carried a multitool, swiss army knife or even a pocket knife knows how valuable a tool can be when needed. It’s common to hear people say that they use whatever tool they carry at least once a day and they couldn’t imagine not having it with them. That’s true. Once you get used to having a tool with you at all times, one that fits your general needs, it becomes very valuable to you. Now of course, all this is directly linked to your general tinkering skills and know how. As I mentioned in the Poxitas post, I used the epoxy cloth patch and a knife to fix my car’s cooling system hose once, but that was possible because I knew how to detect the problem, where to look, how it works on general terms, how to purge the system, how to avoid getting scald with the hot liquid and steam. Same for fixing a leaking AC, unless you figure our why its leaking, how it works and where to look, the tool alone wont fix anything. You need to put a bit of extra effort if you expect to use whatever tool you carry for more than cutting a piece of string or opening a box. Yet the tool is the hardware to the software in your head. Without it you can somewhat improvise on occasions, and of course the knowledge is more important because there’s no way around that, but without the tool at the right time you can’t solve the problem at hand. So, what’s all this got to do with Preparedness and Survivalism? It’s likely that you’re already pretty good at tinkering, fixing stuff and solving problems and that you have some sort of multitool (or several) you carry on daily basis. SHTF or not, its always useful to carry a minimum amount of stuff for everyday chores and small inconveniences. Now, why is this extra important when SHTF or when things simply start getting worse? Because the structure you used to rely on before is either starting to fail little by little or is disrupted completely, depending on the nature of the event. Here, we’re already used to many things a lot of people take for granted in other places simply not working. If there’s a blow out in a power substation or street transformer, we already expect to have to wait for days. If the subway brakes down, expect to get out and walk out of there as well as you can on your own, there’s almost no chance of a subway employee showing up with a flashlight and helping people out. If you somehow get trapped or caught at the doors of the Roca train, don’t expect anyone to show up to help, and if he does, I assure you he’ll have no tool to help you. Not even a knife to cut you free if your clothes got tangled on the door or somewhere else. Remember when someone broke into my neighbors home and I had to hand over my flashlight to the cops? They didn’t have one of their own. When my mother’s car was stolen may years ago, and she hurried to the police station near by, they told her they didn’t have any gas for their patrol cars. And that’s how everything is here in Argentina: ½ way through, “A medias” as we use to say around here. This is typical of 3rd world countries and of course typical of emergencies and other problems where you have to cope with the problems yourself. For all these reasons, what during good times is just a way to solve small daily problems or more serious unexpected emergencies, it becomes of much greater importance when you already know the infrastructure and the general system is not to be trusted or depended on. A multitool can always be a lifesaver, can always be made useful no matter what, its just that when the structures and safety nets start failing you know you’ll be more likely to need it, and you learn to depend on it yourself more to solve problems instead of counting on others. I always like tools even before I knew how to use them. Many years later already living in Argentina I found a well worn Swiss Army knife in a pier in Mar del Plata, most likely left behind by a fisherman. That SAK was well worn already when my brother and I found it, and its seen a lot of use all these years. I doubt a lot of people have a SAK with a blade as worn as mine, the tip is almost rounded like a butter knife by now. About 12 years ago I bought my first multi tool. I didn’t have much money and as always, most of these things are much more expensive here than in USA and other countries. But as it usually occurs, when you buy quality you don’t exactly pay bargain prices. As with many other things, paying for quality means you pay once and cry once. That was the case with the Gerber Multi-plier. It’s a “first production run” as stated on the handle, and proudly made in USA. It served me well for many years and still lives in my bag. I bet a cheaper tool wouldn’t have taken ½ the abuse I put that tool through. Yet today there are several more alternatives and there’s been some progress made during these years. The improved multitool designs offer more tools than ever, in a more practical package. 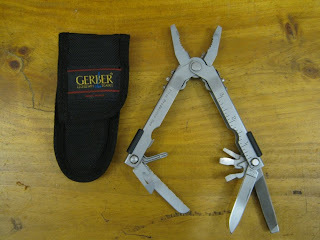 12 year old Gerber Multiplier, my first multitool. The Gerber next to the Leatherman Charge TTi, the pocket clip makes it much easier to carry on daily basis. After doing a bit of research as usual, for me it came down to Leatherman being king of the hill with their Wave and Charge Tti models. I bought both and have been using them and testing, so far the one I like the most is the Charge Tti. Both models are pretty much the same but the Charge has more comfortable handles and a better steel blade, as well as a hook for cutting seatbelts. A review of both will be posted soon but I think its important to explain why tools in general are worth having for the preparedness minded person, and within that realm, the tool you actually carry with you is the most important. I have looked and looked and I've not been able to find any knives with the curves and angles that the knives you showcase have, in any store locally. I wonder why. Have you ever done a post about what you use to sharpen your knives or how? Hi, The Cold Steel Vaquero/El Hombre "s" shape isn't of much use other than fighting. Maybe cutting rope and such, but a straight edge is better for general works. My "El Hombre" remians with teh original edge, razor sharp since I dont use it for anything else and I always make sure I have another blade for general use for this same reason, keep the fighting knife razor sharp. As a matter of fact there is a post aobut how to shapren knives nicely using a mouse pad and sandpaper. Give me a minute and I'll look it up. Also look on the left sidebar where the Topics are, look up for "sharpening" and you'll find a couple more tricks I use to keep my knives sharp. Luke just told me everything is ready so we’re launching the Grab the Apple Preparedness course today. The GTA preparedness course consists of weekly videos (by yours truly :-) ) covering the most important aspects of preparedness, of course heavily oriented on the economic crisis scenario. This means we wont be starting fires with sticks or building shelters with camel poop, but focusing on honest information regarding what you need to know to deal with troubled times better. The guy you’ll first see on the intro is Luke, co-owner of GTA and buddy that handles all the behind the scenes tech stuff. I look a bit more like a Sociopath and my Englsih isn't nearly as good. Entering your name and email sends you to another video by Luke where he talks about some common preparedness mistakes. This is a paying site, $27/month or $17/month if you use the following code: FerFALvip (no spaces, and not case sensitive) Then click on “validate”. If you don’t like what you see, you can cancel at any time and I believe the first 2 weeks are free. Meaning if you cancel within the first couple of weeks the only thing that will be charged is the free CD (45 minute audio CD I made), I thinks its 6 dollars or so. Take care and hope you like it. Feel free to leave comments either here or on the GTA forum, or email either one of us. Hi, can you tell us more about those "Epoxy Bandaids"? I've never heard of them, but they sound really useful. I just use duct tape, normally. What do you know, Poxitas has a really nice website, in English too. POXITAS® is a cloth adhesive patch of great resistance. 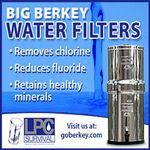 It is ideal for a wide variety of emergency applications at home, in vehicles, when camping and in many other situations." These are like large strips of rubberized cloth tape, but thicker and with better glue.I’ve fixed a number of things with these, even a broken hose tube in my car’s refrigeration system. Also used it in a saddlebag of my bike during a trip in the south. There’s lots of things you can do with these so I always carry a couple in my wallet. This is what I usually have in my jeans pockets. I have more stuff in my bag but its still interesting I guess to see what people have in their pockets. 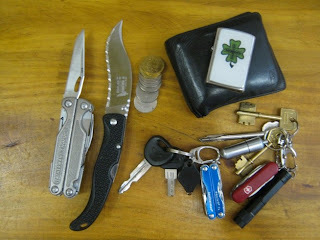 -Lucky Zippo Lighter-Custom made badges by Indy Fan "Relic Raider"
-Coins, usually 2 or 3 pesos worth of coins. I have more in the little Alotids kit in my bag, and I often find myself digging into those. -Paper matches in small ziplock bag. 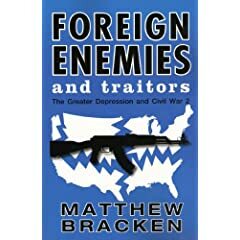 I wanted to say thanks publicly to Matt Bracken for his book review at Amazon. 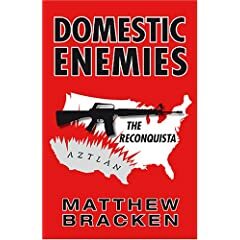 Matt Bracken is the best, most critically acclaimed survival fiction novelist. He’s ex SEAL, so his books also contain realistic use of weapon and tactics and its easy to find lots of advice that can be put into practice. It’s also well written literature, something about impossible to find in the survival genre. Matt is also the guy that first encouraged me to write a book, many years ago. My parents and brothers live in Europe as some of you know. But when my brother got divorced his ex-wife moved back here with my 2 little nephews. She moved together with a friend from school and had another kid. They live just a few blocks away and I try to keep a good relationship with my nephews in spite of what happened. Well, yesterday they got robbed. They live in a house that has two floors, right next to two other homes exactly like it. None of them had burglar bars, which, as I’ve said many times are simply a fact of life here. They broke into the house from the back yard, jumping through the back yard from a neighboring home that is usually empty because the woman that lives there travels a lot. They forced the wooden shutter, forced the window’s weak lock and got inside. My brother’s ex wife new couple is what some of us would call a wimp. Nothing against the guy but you know, the kind of person that says he’s afraid of guns and has the fighting instinct of a butterfly, so there was no home security planning, no burglar bars, no alarm, of course no firearm or any level of awareness. Must be nice to not give a damn or worry about things that I think 24 hours a day! Anyway, they got inside and robbed everything they found on the ground floor, since the bedrooms are upstairs. Nintendo DS (which my brother bought for the kids) Wii, cell phones, clothes, appliances, TV, purse, wallet and everything they found worth taking. They have a dog (….Bichon… Frise… yes, makes sense) but its 45 days old and apparently sleeps with them upstairs. In case anyone is wondering, for good security you should have real dogs (plural) outside and a dog inside, not in your bed but down stairs doing what a dog is supposed to do. Typical of the kind of crime we see these days, they robbed the other two neighboring houses as well, they all have the same layout and design. The neighborhood is just 5 blocks away, but they don’t have private security there. Properties cost ½ but as they say, you get what you pay for. Nothing ever happens and those of us that worry and think about these things are paranoid lunatics, but I prefer to be the way I am. I couldn’t live with myself being that way. Be honest with yourself about your home security guys, and work on your weak spots right away. Don’t wait until you learn the lesson the hard way. The economic situation is kicking in. Spoiled or not, the people from the NY video I posted a few days ago are dealing with a problem common to people both in Europe and all over USA: Unemployment, salary reductions, hours getting cut, all while inflation slowly creeps under the foundations of the family budget. I’m telling you those marketing guys are sneaky sons of a gun. The containers change shape, in ways they look abut the same volume but once you read the actual weight you see you are getting less product. Containers getting smaller, then prices increasing a few cents at a time and one day you find that the cart is only ½ way full for the same amount of money. How did that happen? If you’re one of the lucky ones maybe you’re still in your comfort zone. A good job that pays well, you’ve got medical, your retirement. There’s millions out there that where in that same situation my friend. No one plans on getting shot next week, mugged tomorrow. No woman has scheduled to be raped on the parking lot next month. It just happens. It’s no different with getting fired. Sure maybe there were a few little signs, but its too late when you notice it. Ask the millions that got fired this year, most never saw it coming. This is why its important to have your own thing going on, your own business. Nothing is too silly or too small, but man, having at least SOMETHING makes all the difference when you get home with a box full of office junk. At least you’ve got better than nada, you have a fishing pole, a tool you can at least use with enough patience and time. You’ll have plenty of time in your hands. It’s sad, but some people that unexpectedly get fired after decades of a steady job, they get up at the same time, dress similarly, walk up to that same building… but keep walking, and end up having coffee nearby, using their laptop to job hunt, or read the paper. It’s much better if you already had something. You don’t need to be Donald Trump, but some sort of home business at the very least. There’s people that have websites, blogs (you don’t need to be a genius or have crazy computer skills, I don’t) there’s people that buy and sell stuff on ebay, guys that have their own home office besides their job and do private work within their field. Many here that had just zero resources, they just sold Avon products (kind of Amway) the woman that sold the water filters I talked about, math teachers that give private support lessons, Spanish teachers. Are you getting the picture already? SOMETHING, anything at all is better than zero. If you lose your job you at least have a home business to keep you busy. Don’t expect much from me people. I can only give you a few tips I saw, some I used myself, with greater or lesser success. Since its impossible to know the skills, traits or abilities of each person reading this, I can only give general pointers. Most is common sense, but I guess its not that common sometimes. 1) Be extremely cautious about spending money. Just lost your job, and this “friend” has this killer deal, but you have to put like ½ of your saving into it. Yes, you’re supposed to get filthy rich after a few weeks. Don’t do it. Rent an office/shop? Yes, after you’ve been doing whatever it is you want to do successfully from home for a couple years, THEN think about renting or buying. Be extremely cautious about spending money when starting a small business. Only spend money on those things you absolutely cannot avoid, and always within your means. I’m not wealthy so for me that’s little or no money at all people. 2)Be realistic about your expectations. Remember, we want a small side job, a small part time, home run company that makes a little extra money each month and which can grow if you end up losing your job or if it shows great promise. The people that will become your suppliers, the guy that solves your internet problems, even if it just calling customer service to see how they handle things. Its all part of the network you need and the learning process. The people that will become your potential clients regarding whatever it is your do, from clients of your little home based consulting firm to the people and small shops all around you that buy the excess of what you produce at your home orchard. Do you see already how broad a term I’m referring when I’m talking about a small business? The difference between a millionaire and someone that isn’t is that the millionaire simply never stopped trying. I kid you not, I just resumed right there hundreds of “how to get rich” books. There’s no secret folks, the only secret is simply that the guy that got rich didn’t envision himself any other way. Maybe money isn’t that big a deal for you, and well, that the difference. In average, every guy that got rich failed 17 times before actually getting there. Need I ask? How many times did you try it? Translating this to our current subject, you must be consistent regarding your business. Don’t expect to start, leave things unattended for a couple weeks, then kind of do something else, then get back to it half heartedly… no. Doesn’t work that way. Set up realistic goals and achieve them. Ah! The hardest part of all. Or maybe not. 1)What are you passionate about? 3) What are you good at? Whatever the answer, it can be done in a way it makes money. You’re good at painting? I bet half the people reading this right know believe they are. Maybe you really are. Have you ever sold one of your paintings to anyone? Don’t worry, most people haven’t, even the people that are really good at it. Yet I know rather crappy painters that make a few bucks just doing that. They talk with architects, interior decorators, they do custom jobs at reasonable prices and sell their work for decoration, something that simply matches the colors and character of what the client wants. Its not about becoming the next Leonardo DaVinci, its about selling a few painting and making some money. Do you see the change of perspective here? How many people do you know that took hours of painting classes yet never made a single cent out of it? Its simply the perspective you have of things. One guy is just doing his hobby, yet for another one (maybe even less talented) he’s doing his job. A job he enjoys but a job none the less. For a lawyer, accountant or other professional, a home based office as a side job should be a no brainer. You have no talent, no skill, nothing at all? If you really have the will at least, then you have something. Real example here: A few days ago I learned what a woman was doing as a side job. She’s not what you’d call bright, but she works in a traveling agency. I knew she didn’t have much of a salary but I could tell she had a better standard of living than what you’d expect. Her big secret? She sells stuff on the internet. New Harry Potter movie? She buy s the latest toys and sell them here before they are even imported. Some toys, she gets people to by them for her abroad or buys them herself when she travels because of work, mostly in USA, and sells them here for anywhere from 10 times to 20 times the price she got them for in USA. As you can see, even after a crisis there’s people that will spend the extra buck to buy nice toys. Before saying you can’t do that think of the yard sales and some of the prices on ebay. Another guy I know he just buys appliances and machinery, fixes them and sells them. When he’s got no job in his machinist shop, he does that for a living. 6) Adequate ( as in adapted to the crisis) Marketing is the key. You can’t expect the same strategies to work during a depression. You need to go out there and hunt your clients. Someone once commented in my blog, all you need to do is be good at what you do. I love you man but bs, bs, bs. Let me say that one more time, BS. Even if you’re good, clients wont come flocking through the door. How will they even know about you if you don’t take the first step. Based on what I’ve seen here, of course being good helps and keeps customers happy and the word gets around, but most of the people that do well are good at selling whatever it is they have to sell. You’re the best hair dresser in town, but you sit all day in your saloon bitching about work going down 50%. Meanwhile the woman in the other street that isn’t ½ as good as you are, she’s offering special prices, she’s finding cheaper yet good products, she’s offering crazy Monday and goes home to home doing hairs for no additional cost (“bring a friend and get a discount for both!”), she’s also learned makeup and is doing makeup for sweet 16 and weddings at a competitive price and people already know her. You know what, she even went to the community center or church where she learned makeup and asked about teaching hair dressing herself, for a modest price. Can you see how this could be applied to a hundred other businesses? There’s a dozen other examples I can think of, it all depends on what you do, but I think you get the general idea. Apply it to your situation and set of skills and get started. No forums? That's like forgetting the secret sauce! After several days of hard work and a lot of money invested we finally have a GTA Survival and Preparedness forum. Anyway guys, it was clear that a place for posting and discussing topics was needed. My little blogspot has gone a long way and has an actual community. Now, that community has a place to hang around and talk. As I said before, Grab the Apple website is a project Luke and I have been working on for some time now. As of right now there’s a few post and of course now a brand new forum, that I created just a few minutes ago. Grab the Apple allows me to do many other things that simply aren’t possible to do from a blogspot website. Of course Surviving in Argentina will continue as always, its just that now I have more tools to work with, a domain with dedicated website and a forum. Ok folks, I’ll go check things out at the forum, keep figuring out how everything works , etc. Also make a few posts to get the ball rolling. Here's a rather thorough review of my book at dunedain.net. One clarification though, in my book I clearly say that I consider gold junk jewelry more of a "pocket change" kind of thing. Any larger sums of money that want to be kept safe from fiat currency should be put on recognized gold and silver coins. By the way, there should be an interview following up soon, I'll link to that as well when its done. Take care. With the economic turbulence that began in earnest in 2007, there has been a renewed interest from surprising quarters in what was once the domain of fringe groups and disgruntled Vietnam veterans. In the 70’s “survivalism” became an undercurrent and a catchall for disciplines as varied as defensive pistol shooting and organic gardening, covering an amazing array of interests. Today’s version has been noticed by a far greater slice of the general population, as evinced by firearms and ammunition sales in the US and an unquantifiable but widely acknowledged upswing in the sales of tactical gear, homesteading equipment, water purification kits and the other detritus of a modern day, hardware-fueled urban consumerist that just gained an appreciation of how hard things can fall. For such folk, the temptation is inevitable- the tendency is to buy specialized weapons, gadgets and tools and to think in terms of “bugging out” and leaving to some remote mountain retreat. Most thought is still largely driven by thinking prevalent during the previous surge in interest, perhaps a variation on being prepared to fight the last war . 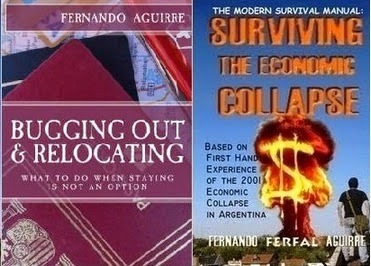 Into this maelstrom of buying, selling, and fantasy scenarios that bear little resemblance to reality comes Fernando Aguirre’s The Modern Survival Manual: Surviving the Economic Collapse. A witness of and participant in the Argentinean economic crisis of 2001-2002, Aguirre watched his first world, urbane and educated society slip with frightening speed into a state of turbulence that produced conditions more readily found in the darker bits of the third world. Pockets of general lawlessness and an upswing in crime were right on the heels of economic paralysis as the government attempted to handle a frightening debt situation with devaluation, depegging of the peso to the dollar, and de facto seizure of economic assets. With alarming speed, the currency devalued to a quarter of its original value, and many secure urban professionals found themselves contending with circumstances for which they were dramatically unprepared. Going into this experience, Aguirre had a modicum of preparation that turned out to be exceptionally useful, including a background with an early education in firearms, unarmed combat and backpacking, which alone can be tremendously useful if for no other reason that it strongly encourages fortitude and self reliance. More importantly, Aguirre was able to adapt to and learn from his situation quickly enough to come out of the situation comparatively intact, no small feat considering the breadth of skills that had to be assimilated. Mindset, awareness of the shadowy world around you, improvisation, even inculcated reactions to incidental confrontations on the street, all had to be retrained in the environment of the new reality. He credits his transformation to his willingness to never quit, to persevere, to adapt, improvise and overcome- and indeed stresses this as the primary tool for anybody in any situation of the gravest extreme. Police involved shootings, stories of survival in the wilderness, accounts of war and even incidents of grave injury all show this as a common and critical element – a firm belief that, come what may, you are going home when this is over, and that you are going to make it for those you love. Aguirre’s motivation to prevail is the foundation upon which all other efforts are built, and they should be for anybody. As someone of repute once said, when man has a why, the how follows. Aguirre gets this. Though he does go into the kit he found useful in a comprehensive manner, he is not what some disreputable musician-types refer to as a “gear queer,” and stresses finding what works for you, not what just came out on the cover of “Survivalist Monthly.” He travels light (though as an aside, I would love to compare contents of our everyday bag, and see who can go for more function with less weight), and insists on what police learn very quickly: you are most likely only going to have what you habitually, physically carry on you to deal with an emergency or emergencies when the feces strikes the rotating oscillator (hereafter referenced, as in the book , as SHTF) . He also seems to have an appreciation for tailoring the tools for the job, and recommends some of his favorites, what worked, and what didn’t. This actually expands into a wider ethos of self reliance for Aguirre, as he notes that if one is serious about preparation for hard times, physical conditioning and what is essentially preventative maintenance on your own body need to be addressed while they may be. One might encounter considerable exertion and much more scarce/expensive medical attention in such environs, and what crises that can be averted or attenuated ahead of time, should be. Similarly, any deficits in knowledge should ideally be addressed in the good times There will inevitably be a very steep learning curve established immediately after things begin to get ugly, and realizing the paramedics aren’t coming after you’ve fallen and broken a leg is no time to learn how to splint. Aguirre advises taking at least basic first aid and CPR courses (easily located by contacting the Red Cross), and if possible, further training in an EMT/trauma mold as it may be available. Hand in hand with this emphasis on preventative training is his insistence that one take charge of the most basic element that the state must provide to maintain viability, and what is frequently the first thing to fail after mass crisis: personal security. Aguirre maintains that all categories of crime became much more prevalent, with robberies, kidnappings and “commando style” home invasions a common occurrence. Concurrently, police response became slower and at times nonexistent, leaving law abiding people with no particular preparation as vulnerable to assault as sheep in the face of wolves. Notably, Aguirre encourages the sheep to become sheep dogs, and have a positive impact on their entire area. Aguirre spends about a third of the book on self defense, covering a wide range of subjects that include improvised weapons, tactical driving, empty hand styles and pistol shooting. Again, his intent is not to give exhaustive instruction, but to communicate some tips and the occasional tricks picked up in his own training or from experience where it mattered. He does well to consider a multidisciplinary approach and stresses the importance of force on force training against an opponent with intent, something sorely missing among the legions of dojo ballerinas that buy a black belt and expect the enemy to attack in a very obliging, very narrow range of action. Aguirre knows this is a good way to get your head pulled off like a crayfish. In fact, Aguirre has a rather good handle on what works, and clearly pays attention to the words of older and wiser men (something that can sure save one some stitches). In the whole of this section, I found only a single element where he mentions something that I find to be aiming in the wrong direction, and to prove just how deep one has to look and how nitpicky I would have to be to truly find any fault with the whole of his effort as regards self defense, I will address Aguirre’s section on boxing and knockouts in general. You will see what I mean. Boxing is the first skillset for empty hand that Aguirre recommends, and indeed it was the first formal unarmed training I received. However, after considering the counsel of various teachers in aikido, competitive breaking and the styles perhaps best typified by John Perkins’ Ki Chuan Do, I came to alternate conclusions than I learned on the heavy bag . Aguirre indeed puts considerable weight on boxing and the idea of a knockout blow, and while he does relay the repeatable actions that can lead to consistent knockout, I feel he goes astray here for two reasons. First, a closed fist to the head, unless targeted very precisely , is just as likely to injure the hand as it is to achieve knockout and second, such precision is a low-percentage shot . While such targeting is considerably easier to acquire ( and less likely to injure the striker) with proper training, the fact remains that the opportunity to deliver a knockout blow is far more often a product of a closed ring with consistent stances, distances and intent than it is on the street . Amateur and pro boxers routinely break knuckles , and always fight with the benefit of wrapped and taped hands inside of protective gloves , something that will be lacking in the street . Any resulting injury is not only going to limit options for the remainder of the incident (if any) but will also be a serious handicap in the weeks and months it will take to heal- time when you can ill afford the incapacitation under the conditions mentioned. And that assumes it will heal properly to begin with, something altogether uncertain considering a quarter of all the bones in the body are in the hands, with the resulting specialization and fragility. I like to make a point this way: if you were challenged to hit a concrete wall with your hand with as much force as possible, without hurting your most important tool, how would you strike? If you say with anything but the heel of the hand, you really ought to spend a few weeks in a cast to encourage remedial thinking. Any place a fist can injure, a palm heel can devastate. The same force that yields a knockout punch might tear a mandible completely out of the socket. Knockout is not a byproduct of striking a nerve in the chin and sending a consciousness-negating signal to the brain. It is a byproduct of an inertia rebound (either at acceleration or deceleration) of the brain off the interior of the skull, or alternately, brief interruption of blood flow to the brain. Any sudden impact to the head can set up such rebound- the goal is quick transmission of force, something that can be more readily accomplished with the hand open. As well, many fights can be defused even very late in the game, and adopting an aggressive, fists-balled posture is telegraphing intent and possibly making a fight a self-fulfilling prophecy. 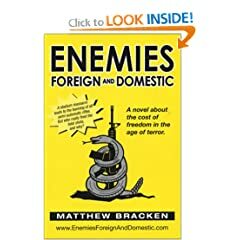 With hands open toward a potential attacker, you appear conciliatory or at least unprepared, when in fact you are that much closer to performing a grab that turns into a grapple, or an open hand soft tissue strike following the palm heel, like eye rakes/gouges, ” fish hooking” and ear tears. Hey, nobody said soft tissue on the head was sacred. Destroy the opponent and preserve your weapons. Think long term. Other than that bit, which seemed to stick out in prominence because the rest of the defense advice was largely so sound, I could find nothing to correct or critique. He sees the force continuum appropriately. In the gravest extreme, you must always be prepared to take it to the next level of force if you would ultimately prevail or fall, and Aguirre, again, gets this. Another note: Aguirre goes at some length into the proper selection, carry and use of a knife, drawing again from force on force training and the colorful past of the gauchos, hard bitten Argentinian cattlemen from the pampas that lived and died on the points and edges of their facon. The knife is something that does not get much attention in the West, as it is a brutal weapon more commonly associated here with Jack the Ripper and OJ Simpson than a decent person trying to stay alive. This is a foolishness that emergency will ill afford, as a knife is a tremendous close quarters tool, something that can be both hideously effective and omnipresent, often allowed in places where a gun is not permitted. Proper intent above all else matters with the knife, as it is a hard business to carve into another human being , no matter how ornery they may be; but once that line has been understood and kept in perspective, a blade can be more lethal than a pistol. Again, Aguirre gets this. Besides the heavy and warranted emphasis on defense, Aguirre relates some tips and tricks of storing what you use as foodstuffs and household items. He advocates getting as much as you can afford, in terms of money and storage space, of what you already use, always with an eye towards securing items in a way that will preserve utility. As well, he deals with what might be handy to have around in a compromised economy, items such as small bits of gold (NOT bullion or coins) and foreign currency that may be more valuable than toilet paper. The tips are still valuable, though, if nothing else than they paint a picture of an economy driven by need and ingenuity, developing in the shadows of the official (non-functioning) economy. It is quite a leap from there to the Road Warrior (though Bartertown from the third Mad Max movie does get an honorable mention), something most survival authors usually miss because they simply haven’t been there. Again, Aguirre has. It would be very difficult to even mention all the angles brought up in the book, as it is comprehensive in its approach in a way that an abstract relation of facts and techniques can never be. This is the life experience of a determined man relayed in sometimes less than perfect English, a snapshot of how he handled waking up one day to find that his country wasn’t really there any more. However, if you are looking for instruction in specific disciplines with a thorough, specialist’s focus in any of the fields Aguirre mentions, there are better books to be had. If you were to have only one comprehensive manual collating likely details and tables that might be needed into a one-volume survival library, this would not be it. However, Aguirre’s Modern Survival Manual is a great beginning in the pursuit of finding out how to stay alive when it seems God might not want that as much as you do. I get several emails regarding Uruguay and other countries, people wondering what I would recommend them. Well, Uruguay sure is a good alternative. Tom (an American that is currently located in Bs As) told me the other day on an email that Uruguay has the highest gun ownership ratio in all Latin America. I didn’t know that fact but its not much of a surprise: Uruguay is a wonderful alternative for people that want to relocate. Argentina is bigger, has a Buenos Aires which is a larger metropolis with more cultural activity and nightlife but Uruguay has always been a place for the elite. Much safer than Argentina, Uruguay has always been a fiscal paradise were people keep their money safe. During the 2001, entire CIT trucks left from Argentina and headed to Uruguay, full of dollars. Uruguay is much smaller, not as heavily populated, and by far better organized than Argentina. It enjoys far less poverty and better education, and both translate into safer, less violent streets. 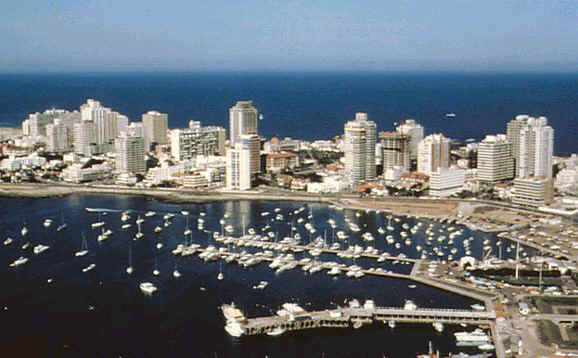 Sure, anyone wondering about Uruguay, that’s where I’d go if for some reason I wanted to relocate to South America. Argentina is close enough in case you want to look around, so is Brazil. It’s a nice strategic spot with a solid government, compared to the neighboring countries. Hope that answered some of the questions. GTA is a project I’ve been working in during this year, along with Texan prepper Luke Walker. It’s almost impossible to find a person to work along with, that understands what you mean and has skills that compliment your own. Well, Luke is that guy. He’s also been an actively involved American citizen, even before he started prepping, supporting Ron Paul, participating in rallies, tea parties, etc. We’ve been developing this website for some time now and soon we’ll be launching a preparedness course that consists of a series of videos. As of right now there’s a few articles by Luke and myself. They are on a similar line of thought to what you usually read here so if you are a frequent visitor I’m sure you’d like to look around a bit. Grab the Apple isn’t about predicting the end of the world, trying to estimate when a meteor will destroy man kind based on the Mayan calendar or reading the cabala in my breakfast bowl of Corn Flakes. Its about having a prepared mindset regarding life in general. Of course the economic situation is already a reality so that’s a topic covered often, but the idea is to prepare to live better lives, not preparing as an excuse to live a dark, miserable existence. Hope you guys like the website and please do leave comments, thoughts and suggestions. Doesn’t sound survival related but it sure is. I thought I wrote about this before but apparently I didn’t. Besides, its very relevant for Americans and people around the world as of right NOW. There are many factor as of why having a family and mostly not being on your own makes a difference during hard times. There are some disadvantages of course: More mouths to feed, more chances of someone making a mistake regarding security, you are more vulnerable regarding some points, but overall nature is wise, having a family has more benefits overall. If the mind doesn’t keep up, the physical aspects don’t mean much at all. For many coming back home after a hard day of work, the family makes a huge difference. That’s a picture I’m sure many of you are already familiar with. Now add to that familiar picture rampant inflation, wages comparatively low that buy less and less each passing month, bad working conditions due to stress, your boss using you to vent his own problems, and a city that doesn’t work half of the time the picture gets even more complex. Imagine having to spend several hours to get to your job because of protests, strikes, suicidals jumping under the train, or God knows what else. When I worked in an office on the Capital district, life for me was miserable indeed. There’s something about arriving to the office already covered in sweat from a dozen different strangers, because you travel like an animal due to the poor subway and train infrastructure that can’t keep up with rush hour. Tolerating a boss with an eating disorder and lots of personal problems, then getting back inside a sweaty can of human meat, many people there already drunk and smelling like puke. The trains and subways in Constitucion station are little bits of hell on earth during rush hour. You are packed so tight, people even travel hanging from the train or on the roof. Small people, children or pregnant women simply can’t get in because they risk getting crushed inside. I would walk through the door, strip and take a shower, then throw some clothes on me and lay flat on the floor, exhausted. My kid and wife, they would curl around me and laying there would give me the morale boost I needed. I suppose this is why people in Latin America and third world countries have tighter family bonds. Family is emotional support. To some extremely poor people, family, their children, is all they have in this world. Anyone familiar with forum flame wars is used to reading this: “He’s just a 40 year old living in mom’s basement”. Sadly that is true and will become more common as time goes by. Something very common here is young adults moving back to their parents because they can’t afford the costs, several families living under the same roof. All of a sudden a lot of people in USA are now losing their homes and “living in mom’s basement” takes a new, sad twist. Truth be told, most houses in USA are pretty big by international standards ant there’s enough space. *Bills get divided into a larger number of work-capable people. *There’s always teen or grandpa to do nanny work. Saves you the day care center cost and allows adults to work. *The house is rarely empty, safer in case of burglars and robberies. *A greater set of skills, to start family, home based business of some sort. You rarely find a family that gets along so well that they all enjoy living together, but when there’s no other choice it becomes a more attractive option. Family, even though if not very close, is still family. When you need them you can usually count on them, a favor, money, or help in some kind of way family is usually the first that comes to mind. The old Spaniards and Italians that came to Argentina, they still had those old notions about children taking care of them when they grow old. It worked that way back then, and you can still hear some talk about the eldest daughter being the one that is supposed to take care of the parents when they can’t handle things themselves any more. Surprisingly, that’s the way it works for many families I know of. The eldest daughter caring for them, often never marrying. Not a nice picture but some of those traditions die hard, even in modern times. So guys, while popping out a 8 brats like the John and Kate +8 family isn’t wise because unless you have your own TV show you’ll go broke in no time, family has several advantages preparedness wise and for life in general. Those of us that have kids, of course we don’t do it as a rational strategy, its would be pathetic to think that way. None the less, people with kids have an emotional support people that alive alone don’t have. Just another thing to thing about and keep in mind. The reasons for writing about gear and their reviews are many. Of course I do enjoy writing about it, that’s good enough. Money being a limited resource for most of us, I myself will read lots of reviews before spending a single buck, and I advice everyone to do the same. I also enjoy using them and having them handy. As my son opened the gifts grandpa brought today, the Minichamp earned its space in my pocket once again, cutting the tape and small plastic straps, later the wonderful Minichamp Philips tool was used to open the battery compartment. But there’s more to it. First, while coping and dealing with problems is a matter of mindset, a tool makes solving those problems a much easier task. No matter how much mindset you have, you can’t cut rope or unscrew the plastic cover of an air conditioner unit with mindset. You need tools, and the more you learn to deal with stuff, improvise, fix things, the more important your tools become. This doesn’r sound very survival related but there are other cases were fixing something may make a world of a difference. I’ve used my knife and a bit of tape to fix a leaking car hose, without such a fix I would have been stuck on the road. I’ve used my Gerber multitool to replace a windshield sweeper during a stormy night. Without such tool ( and LED) I wouldn’t have been able to fix it. For several months now, the Minichamp has earned a place in my little tinkering heart. I have used it to install a network card on my PC motherboard, tighten the screws on my car door’s lock, cut dozens of strings, cut out newspaper articles and write down phone numbers when no pen was handy at the time. For me, there’s no equal when considering size/quality/utility/price. I do love the Victorinox Minichamp. Read previous posts about it. 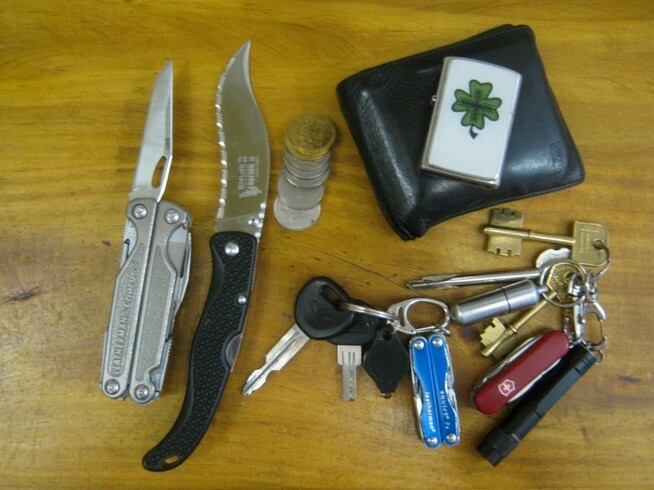 But then came the Leatherman Squirt P4, Leatherman’s keychain multitool. I liked what I saw, but went cautiously, buying a used one on ebay for 10 bucks plus shipping. Worn exterior, but little real use. Perfect. I got it, liked it, started using it, and the more I use it the more I like it. Never thought the Minichamp could have such competition. Both are about the same size, have somewhat similar tools and are very well made. Which one to pick? Blade: The most often used tool and the harder to improvise. 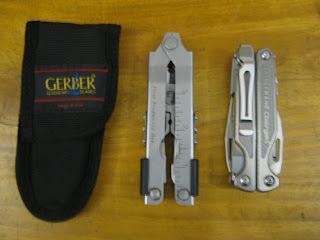 Here, Leatherman wins with a blade that, even though its as long as the Minichamp, its wider and thicker, about 40% bigger than the one in the Minichamp. The Minichamp one is clearly more fragile, but at least you have two blades in case you brake the main one. Screwdrivers: The P4 has a flat Phillips screwdriver that works kind of ok. The Minichamp Phillips is a little work of art, somehow fits most screws and works perfectly. The P4 has nicer flat screwdrivers(small and large) , but the Minichamp has the cutitcle pusher that works like a large flat and a small one with a ruler. Awl: The P4 has one, but I improvised making holes with the Minichamp’s scrapping tool. File: Both have one but the P4 one is much nicer. Spring action pliers and wire cutter, a nice blade, nice small screwdriver. Scissors, ruler, red LED light and pen. So, both have a few similarities, but if I had to choose just one, the Minichamp has more uses and it proves that on daily basis. 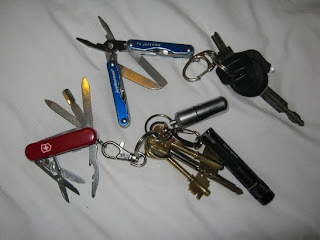 Yet the pliers … I settled with the Minichamp on my house keys and the P4 for my car keys along with a small LED. where a person hits the streets during the incidents of the 2001 economic collapse in Buenos Aires. So what did our friend do wrong and what can we learn from his experience, so as to not make the same mistakes if we find ourselves in a similar situation? 1)Don’t go out when there’s chaos. This is the most obvious mistake. I know what the writer says about being a historic moment and wanting to be part of it, be a witness. I felt the same way. Yet I knew well there’s a risk. Even for the first “cacerolazo” there’s always the chance of coming across trouble. These days more than ever, with the official thugs, lead by Mr. Kirchner himself, “winning” Plaza de Mayo by beating up people (his own words). For them it’s a war. Trouble? Stay put. That’s always the smartest thing to do and it should be obvious enough. 2) Have the appropriate gear. There’s a minimum amount of gear you should carry with you at all times. The writer mentions tear gas, smoke, etc. 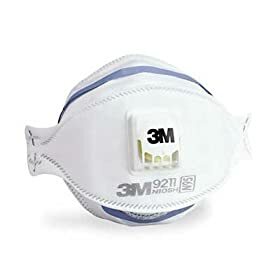 A face mask wont do anything at all to protect your eyes, but at least you can breathe a bit bitter when there’s a lot of smoke. Make sure to get a good quality collapsible face mask with valve. That’s the one I have in my kit at all times. Takes up no space at all and can be invaluable. Remember the part where he mention’s gathering around a broken water pipe, along with 20 others to wash his eyes after the tear gas? I remember in 9/11, there was a cop flushing his caked face, covered in dust and debris, using a small water bottle. How priceless can water be when you need it the most! Not just for drinking. The writer mentions getting lost and not knowing where he was after getting disoriented, even though he made the entire trip on foot!! (there’s a lesson there, how easy you can get lost when nervous/scared/etc) A small map or guide of your area is essential. 6) Other things not mentioned but that I would like to have in such a situation: A weapon to defend myself, a flashlight and at least a small FM radio to know the basic news. A police scanner would be even better to know the latest events as they develop. Finally, as always, how important it is to be in proper shape. Running, fighting if needed, having good lung capacity, you’ll need all that and more. Just some thoughts, comments and other things I’m surely missing, all welcomed. Let me join everyone in saying how absolutely useful is your advice. I'm in Australia and everyone here seems to think that SHTF is totally improbable but that makes me more deternined to work out my exit strategy - or actually my stay in place and not drown strategy. So can I ask you, with your real estate, was it near you, or did you travel out to collect rent? How did it work in the day to day sense? 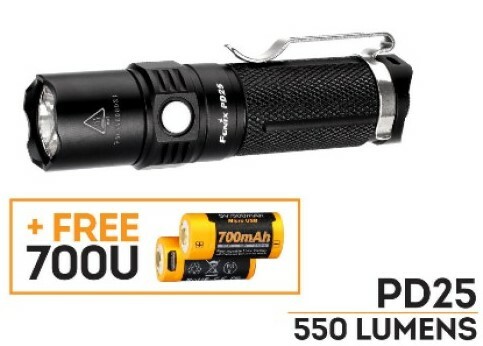 Also, how about stun guns? What are your thoughts? Preparing is only a reasonable step given that sooner or later something happens, you need to cope, deal with some emergency, even grow old, or suffering an illness. You prepare for that as well. Regarding collecting rent, I still do that and try to be careful about it. If I can, I prefer having the people do a bank deposit, and quickly withdraw. Even if the person lives 2 blocks away I prefer to do that for safety reasons, and a lot of people, at least those that are somewhat careful, do the same thing. For other cases I try to be careful, if picking large amounts of money I have a car waiting (remis). I try not to have a fixed routine in case anyone starts noticing . Other than those things there’s not much else to do, I just try to be careful and alert. About stun guns, I can only give you my opinion but I’m no expert or anything close to it. I have a stun gun and think its pretty intimidating, and gives away one heck of a shock. Having said that, those old stun guns are nothing like the Tasers you see today that fire a couple darts. The old stun gun wasn’t as effective at putting people down, and you needed to be at contact range unlike the Taser. I see you’re in Australia, so I suppose a handgun isn’t an option. Then yes, a Taser’s range, even though limited, would be a nice bonus and I’d consider it seriously if I can’t carry handguns.